A list of retired racing greyhounds adopted through Greyhound Crossroads in 2009. 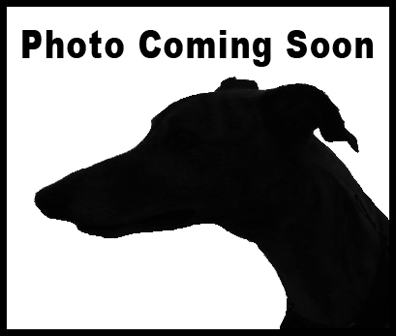 We began placing greyhounds in 1997, but our website was rebuilt in 2009 and we do not have the adoptions done previous to that on this website. 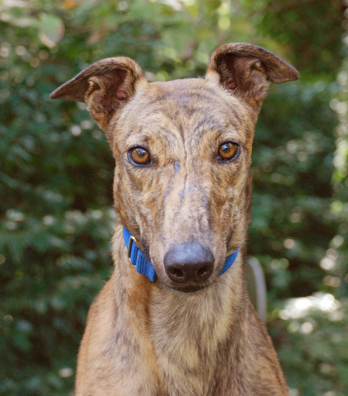 Dart raced at the now closed Raynam/Taunton Track in MA. He only has 11 races listed and only one win. He is a big guy that raced at 79lbs. His sire is RJ's Gary B and his dam is Reward Lady Bone. Dart came to us from another adoption group in hopes we could help him with some behavioral issues he was having with other dogs. They had already been working with him and did a great job. By the time we got him he did fine with the dogs in his foster home. He is even OK with a small dog in his foster home but still needs to be tested with cats. Update after adoption: Dart seems to have overcome his aggression and lives with another dog now. He was working on becoming a therapy dog before he crossed the bridge. 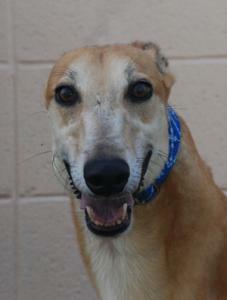 Star is one of our favorites at the track kennel. When we go to pick up dogs she always greets us with enthusiasm and is a very friendly sweet girl. She is mostly white with a black patch over one eye so is as cute as she can be too. She was a pretty good racer and we have been waiting on her to retire for a couple of years. Star is a very special girl that the GC group has been waiting to take in for a couple of years. She is as bright as her name, both in beauty and intelligence! She would like some dog companionship to truly shine and likes to be included in daily activities. She enjoys bouncing around the yard, but would do fine in an apartment or unfenced home with plenty of exercise (she is still a young girl). She is quiet when crated but likes to have a doggie friend nearby so she is not all alone. 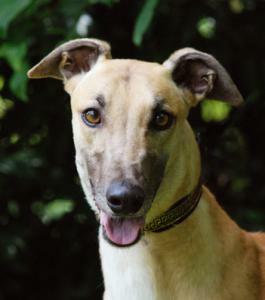 Star is a very laid back dog who is undisturbed by loud noises or activity so would do great with children she is also very tolerant of being touched and moved when sleeping. She is content to lounge on her bed for the evening after dinner and enjoys just being close to her human pack. Because she is so smart, she needs to have the rules clearly defined. She is happy to follow the rules once they have been set down. She has a great memory and rarely forgets what is allowed or not. She will truly be the "star" of some lucky family's life! Cuddly, gentle, and sweet, this girl is looking for the home that recognizes just how special she is. Red Robin came to us from the JCKC race track in Florida. She also raced at Orange Park in FL and Victoryland in Alabama. She raced 111 races but raced mainly at the lower levels only getting up to the B level a few times and spending most of her time in C and D. Red Robin raced at 59lbs. She was born on March 12 of 2002 and her sire is the very famous Molotov and her dam is Cajun Amy. She passed her cat and small dog tests and is good with kids. Finn and his littermates Ethan & George are available. Finn is a mid sized male at 72lbs. They have been together for their entire lives - three and a half years and it would be wonderful to place them together but we have done a trial separation and they all seem like they would be OK living alone too. They are all reported to be as sweet as their name and wonderful, beautiful boys. They sleep together in a pile. All are friendly and loving. If you are interested in one, two or all three boys who are already bonded to each other, let us know and we can set up a meeting for you with them. Finn is in a foster home with his brother Ethan and is doing great on his potty training and house manners and is very well behaved. He is a grinner like his brothers and will grin when happy excited or when he thinks he is in trouble. He is so well behaved that is rare though. Finn is a friendly, happy loving guy that likes to sleep in his crate and is fascinated with his first Christmas tree. 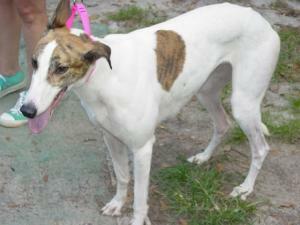 This pretty little white and brindle girl was adopted by a family then was abandoned at a shelter. Sophie is safe with us now and has been checked and given a dental by our vet and is ready for adoption. She tolerant of dogs, cats, and small children. Sophie is very sweet and even though she is an older girl still is playful and silly. This is a wonderful girl that is just a little shy with new people at first but warms up very quickly. Sophie would love to spend her birthday on Dec 8th with her new family. Her sire is Follies Bergiere and her dam is Memphis Ace. She was born on December 8th of 2000. She raced only 5 races at the Mobile Track. She is a small girl and raced at just 55lbs. 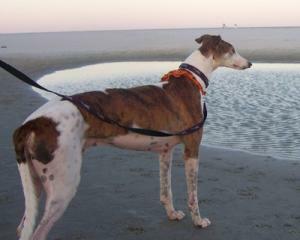 Sophie was adopted and was well loved until an illness took her suddenly toward the end of 2011. Desi is shy, but willing. She likes getting loves, but doesn't come up and ask for them. She has already become very attached to her housemate Finnegan, and stays very close to him for cues. She rides very nicely in a car, and is a quiet girl. She is actually afraid of the housemate cats, and won't go near them. She will go in her crate on her own sometimes - I think to take a break from all of her new surroundings. She loves food, but doesn't gobble, and as a dainty eater. She has met a few people now, and with a little coaxing, she will go up and get love. Once someone starts petting her, she is fine and is just afraid to make the initial approach. She has also met a couple of small dogs and was absolutely fine with them. She was very curious. With some time, some love and a gentle hand, this little girl is going to be an incredible pet. Desi is going to end up being absolutely devoted to the person who gives her a forever home. She is so sweet, and so pretty. She is going to be worth the patience and love. As she settles in and learns how to be just a dog, she is going to be a very, very special girl. Mattie is a small 54lb female. She has no races listed. Her sire is Clappin Thunder and her dam is Blindedbythelite. Mattie loves people and wants to be around them more than the other doggy housemates. 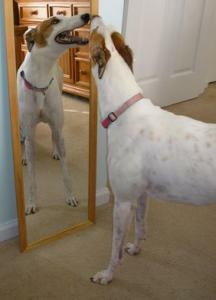 She has shown no anxiety moving into her foster home and new life-- learned to go up and down stairs right away, and even likes looking at herself in the mirror! She chases balls, loves to play, and is showing herself to be smart enough to learn tricks. What a beautiful, smart girl! Update after adoption: Chase has been adopted and her bone cancer has never returned. She is one very lucky giri and her family dearly loves her. Crayons is a sweet, outgoing girl that loves everyone and will give gentle hugs. She knows how to sit already and knows several other tricks. She can be vocal when left alone so would not be a good dog for apartment living. She seems to be cat and small dog tolerant and likes children. She gets along well with other dogs too. This is a very devoted girl that just wants to be with her family and will be a very loving pet. Updated description! Through experience with her foster home, we think Crayons would be best suited to a home with at least one other dog for company and a human who is home a lot. She doesn't like to be alone and is much more comfortable with people around. 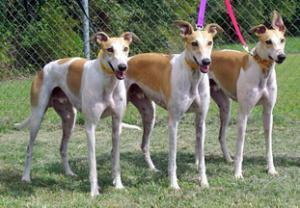 Her energy and personality also respond best to being part of a pack. She is an adorable little girl who bonds tightly with her humans and will return that attention joyfully. This is girl that is full of fun and love. Her sire is Impossible Dream and her dam is Tech Shock. Angel just arrived from the Sanford Orlando Race Track. She also raced at Naples Ft Meyers. Her sire is the famous Lonesome Cry and her dam is Nikos Vindicator. Angel was born on July 5th 2007. She is a very sweet 2 year old girl that is well behaved. Her foster home says that she will be very hard to let go. 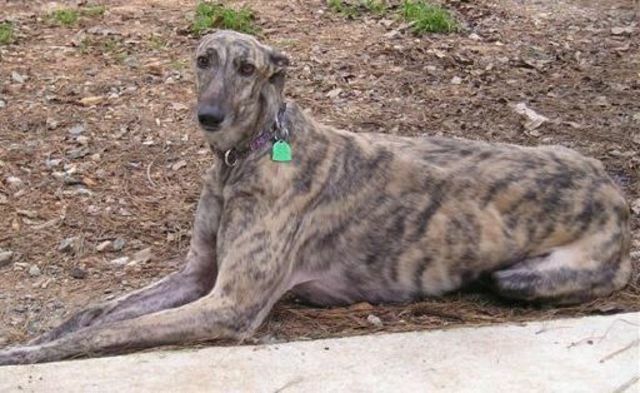 Angel is a beautiful 58lb white girl with dark brindle spots. No she doesn't have a dirty nose in the photo. She just has a little muzzle stain on her nose that should go away with time. 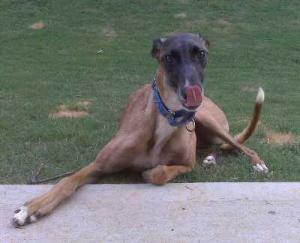 Angel gives kisses, loves to play with toys and has a weakness for hamburgers and french fries. She is small dog and cat tolerant too. This little girl was released from a shelter near Savannah into the care of GC. She was never registered to race but she was tattooed so we could look up her pedigree. We don't know much more about her history and haven't discovered which adoption group she originated from. Savannah was initially interested n the kitties, but quickly responds to correction. She also did very well with small dogs and the young children (3 and 5) in her foster placement. She is calm, easy-going and loves to cuddle with her humans. She doesn't chew on items inappropriately, has great house manners, and doesn't display any anxiety at being left alone. She is slightly timid when first approached and at feeding time, preferring to eat alone. 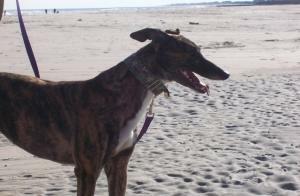 Savannah seems to be a dog who will fit into almost any home, whether there is another greyhound with her or not. Zea is truly one of those rare dogs that comes along only every so often. She is so loving and docile, a real doll! 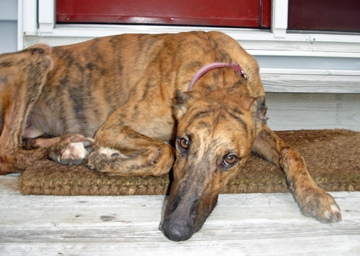 Zea is a beautiful 54-pound brindle girl who just turned four. She is a submissive girl who has no aspirations of being the lead sled dog, but that doesn't mean she is a wilting flower by any means! 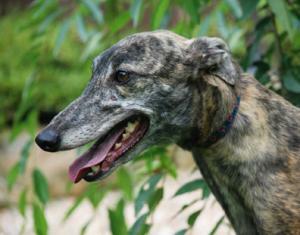 She is currently being fostered with both greys and small dogs, and has easily integrated into the pack. She loves to greet you on your arrival and will nuzzle with you to get the maximum amount of love she can. Her tail wags a million miles an hour! She is quiet when crated and will sometimes seek out her crate during the day to catch a few winks of 'quiet time,' but can also be found curled up on her doggie bed in the living room, protecting all occupants from any stuffies that may be lurking nearby. In addition to killing stuffies, she LOVES to chase a ball and will bring it back and drop it at your feet as long as you are willing to throw it. She rarely barks unless encouraged to do so, and her bark is surprisingly deep, especially for a smaller female. 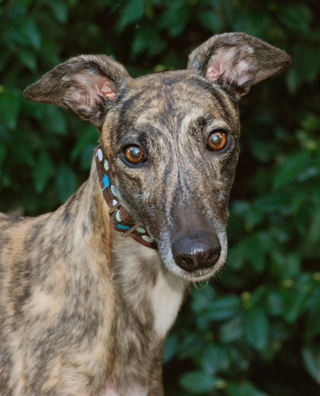 Once she gets over initial shyness to new people or situations, Zea is one of the friendliest greyhounds we have ever met. If you drop a pan on the floor, she may startle and dash out of the kitchen, but will quickly return to check out what made that loud noise. She does not exhibit Alpha behavior at all, but is so smart and willing to please that she learns quickly in order to please her human pack. Zea is not food agressive and will easily yield her dinner dish to you. She is small dog and child safe. She walks great on leash and stays right near you. She easily figured out stairs, so long as they are solid and not slotted/open (like a deck or pier). 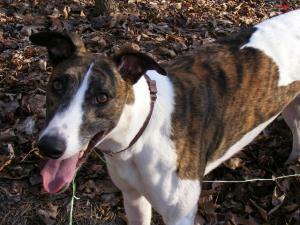 She would make a great first greyhound for someone, or would also fit well into an existing pack. Baby Bunny is one of our tiniest females at just 48lbs. She is a petite, little, black girl that loves to snuggle. She can be a little timid at first but seems like she will warm up eventually. She has already decided that the best place in the house is the couch curled up next to her foster mom. Baby Bunny has discovered the joys of playing with toys and love to throw them around and pounce on them. She is going to be a fun little girl for some lucky family. Bunny seems to need to be around another outgoing greyhound and usually only approaches people when the other grey does. Like most shy dogs, loud noises and quick movements can send her diving for cover so she would do best in a home without small children but might be OK with very calm quiet older kids. Because she is shy and tends to bolt when scared she must have a fenced yard. Her sire is the famous Dave The Dog that is retired and living in Upstate SC and her dam is ICU Lady. DOB 10/30/07. Luke is a very large, sweet, silly boy. He is considered special needs because he is blind in his right eye due to an injury he received as a puppy, but he doesn't seem to let that slow him down. 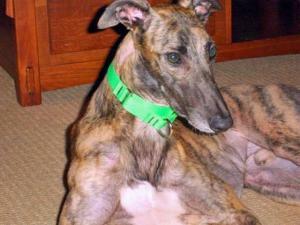 He gets along great with the other dogs in his foster home and is very loving and playful. He walks nicely on a leash and is completely potty trained. 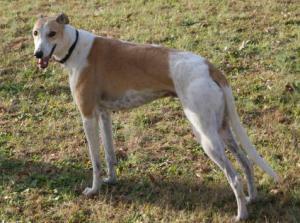 Luke is intelligent and will do best with a family that enjoys obedience training and will be confident pack leaders. He will make an awesome addition to the right home! 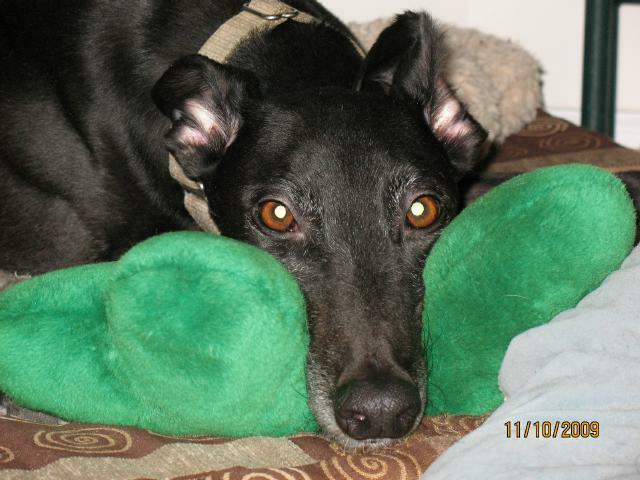 Luke tested cat tolerant and is living with small dogs in his foster home. 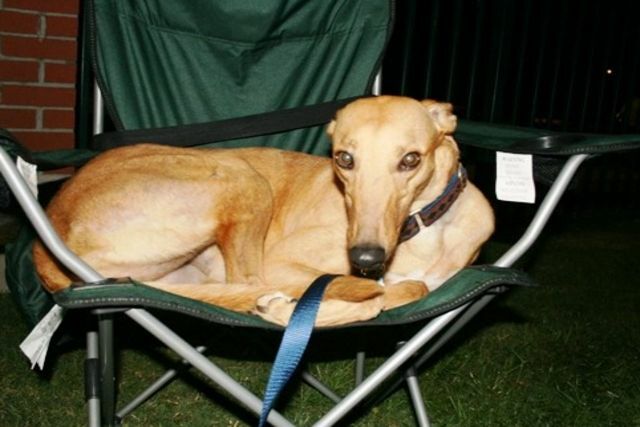 Luke was never registered and never raced so we don't know who his parents are or much about him. 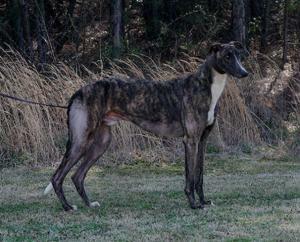 Lady is a 2.5 year old brindle girl that has no races listed. Her sire is DK's Prime Time and her dam is CWCs Mirage. She was born on 4/8/07 and weighs 58lbs. 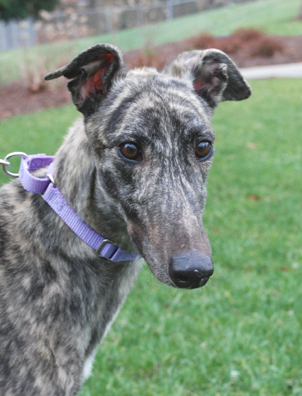 She's pretty timid and shy at first and will need some time to warm up to a new family. Because fast movements and loud noises make her uncomfortable she needs a home with quiet older children or no children. Young active kids would probably scare her but she has warmed up to older children in her foster home. Lady loves to ride in the car and crates well. She walks and potties on leash too so might be OK in living in an apartment or townhome. She passed her cat and small dog tests so should be OK in a home with either. Carrot (or Care Bear) is a very tiny, sweet, happy girl that doesn't know a stranger. She is mid level energy with enough energy to be fun and playful. She walks great on leash and likes to go for walks as long as they aren't too long. She went hiking once with her foster mom and didn't care for it much. She is a very girly girl and didn't care for the rough terrain. Two of Care Bear's favorite things are her chew toys and her people. If she does anything wrong she responds very well to correction - once or twice is usually all it takes because she wants to please. She is getting along well with the tiny dogs in her foster home and is getting used to the cats. She can be a little vocal when left alone so may not be the best dog for apartment living. Just look at that adorable face she is a hard one to resist! Caller is a dignified gentleman and prances around the home exploring everything. He enjoys a comfy bed and will push the bed & blanket around to make it just right. He has good house manners and seems to be friends with everyone & everything he meets, including the cats in his foster home. Caller has a fun loving side as well, swinging toys around and rooting in the toy box to find just what he wants. His sire is Dominator and his dam is Mega Goosebumps. Caller was a great racer in his day and was a finalist in the 2004 Hollywood Classic and set the 6/16th track record on 2/12/14. He raced 127 races at Flagler, Mardi Gras and Naples Ft Myers. Endura only has 9 races listed and never won one of them. 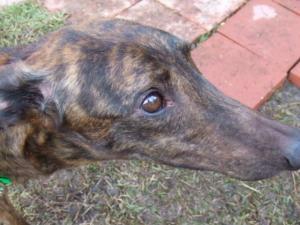 Even though she wasn't a good racer she had a good pedigree so she had one litter of 5 puppies in 2009. She had complications having those pups so had to be spayed and retired. Her sire is Coldwater Konow and her dam is Victorian Ruler. 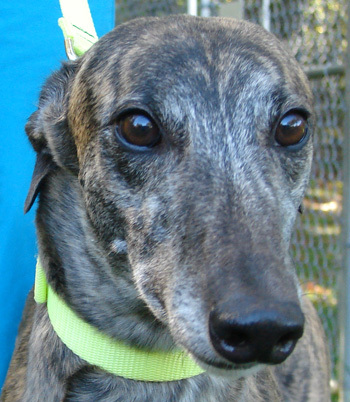 Endura is a small girl that raced at just 56lbs and DOB is 4/21/04. 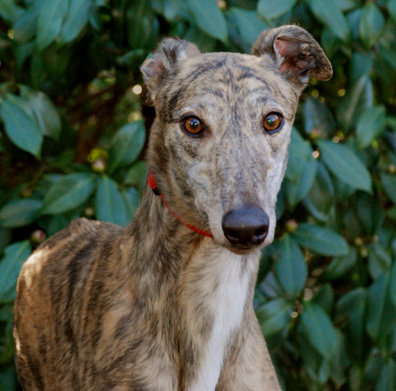 Endura is a sweet girl that is slightly shy at first but seems like she will warm up quickly. Pretty Doll raced at Sanford Orlando Track but not for long. Her sire is Maryville Rumble and her dam is Sobe Grand Capri. Pretty Doll lives up to her name, she is a very pretty, tiny little doll. She is calm, quiet and well behaved in her foster home. She likes to play with toys and go for rides but doesn't like to wear coats on cold days. 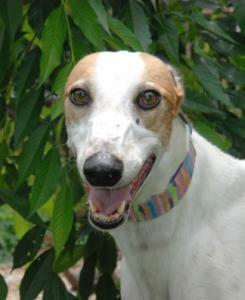 She is a friendly, happy little girl that will make a great family pet. 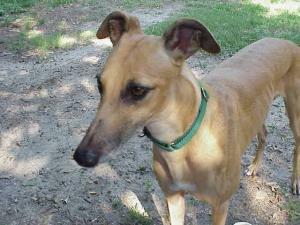 She gets along well with the other dogs and cats in her foster home and walks nicely on leash. She also seems to like the children she has met and is gentle with them. This little girl will go fast! 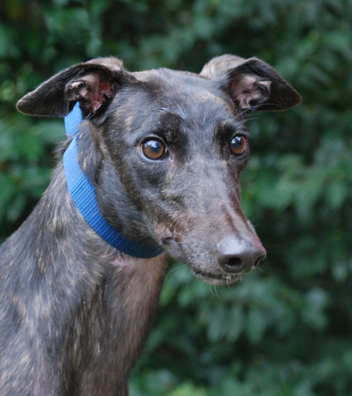 Fancy is just over 2 yrs old and is a spunky little girl that raced at just 55lbs. She only raced 7 races and never won one of them. 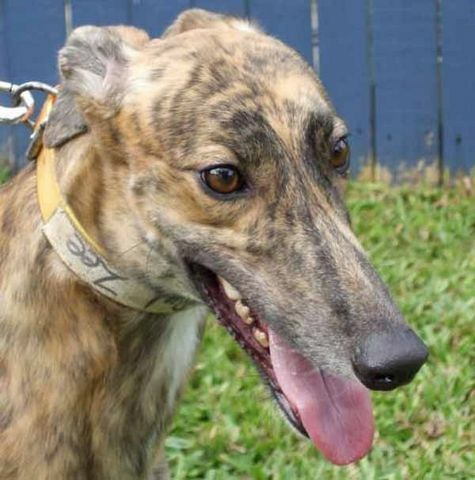 She tried her luck at Derby Lane, Naples Ft Myers and Sanford Orlando before they officially retired her. We also placed her mom Park Top. Her sire is Maryville Rumble. Fancy passed her first cat test and seems to just love everyone. She has a lot of energy and needs some work on leash walking but takes correction well. She has been great in the house and made herself right at home immediately. She loves hoarding toys and has fun hiding them finding them later on. Barney is a gorgeous red brindle boy that didn't race. He is just 15 months old and decided to play rather than chase the lure in training. He is very calm and well behaved for such a young guy. He loves to go for rides and lays on the back seat and looks out the window. Barney potties well on leash so may be OK without a fenced yard if he gets regular walks. He crates happily and isn't much of a marker so should be easy to potty train. He gets along well with other dogs and let the girls in his pen at the farm boss him around even though he was bigger. 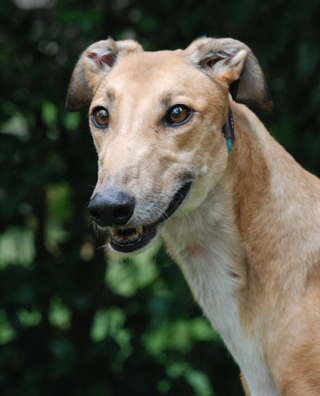 He is a medium sized male with a very outgoing personality. With his calm, well behaved, friendly nature he would probably make an excellent Therapy Dog or just a great family pet. Barney is cat, kid and small dog tolerant. 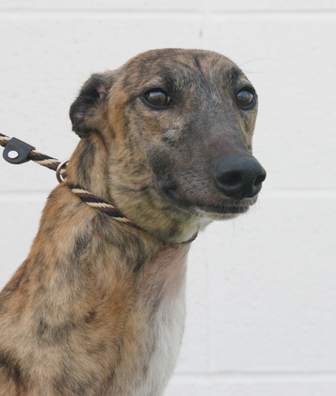 Wonda came in to us from the Birmingham Race Course. He sire was Buzz Around and her dam was Reward Popatop. She was born on December 23rd of 2004 and raced at 60lbs. Wonda is a very sweet and friendly girl who was known in her kennel for wagging hard and getting excited by the attention she loves most from her humans. She passed her cat and small dog tolerance test and shows very little interest after being given a chance to sniff and check out the critters. Wonda responds well to her name, comes when called, and responds right away to correction when she makes a mistake. 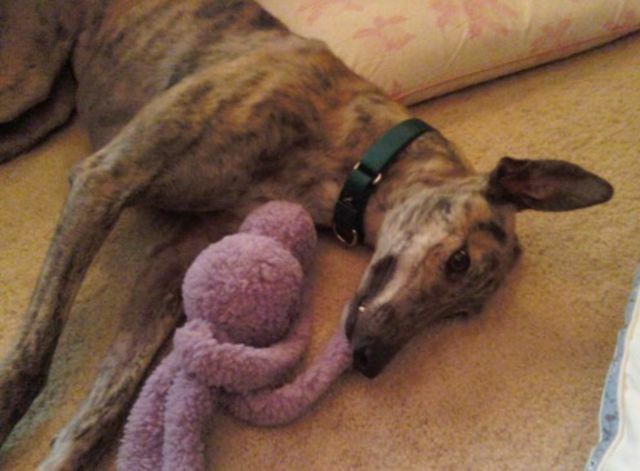 Wonda has no problems with slick floors or adjusting to strange walkways and bridges around her foster home. This is a intelligent, outgoing girl that will make a great companion! 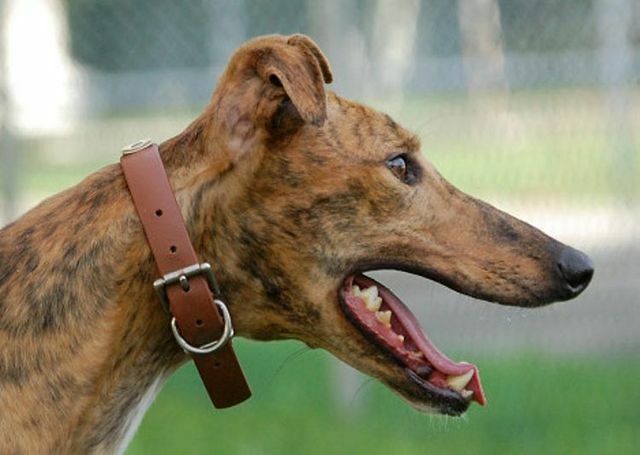 Zack only raced 11 races at Derby Lane and Flagler tracks and wasn't able to win one of them. In his last race he didn't even run so he was retired. He has been living in a home since he was 2 and he is a very loving boy. Due to his slightly timid nature, loud noises and abrupt movement tend to scare him. Because of this, we think he would do better with older quiet kids. Zack loves to play with toys. He is a Velcro boy and does not want to leave your side. Zack was adopted with Zee (Designed by Zee) three years ago, straight from the track. They are very bonded to each other and make an absolutely perfect pair. We can separate them if necessary, but it would be so marvelous to find a home searching for two best friends. Zack is home acclimated and was not returned because of anything he did. His sire is the famous Lonesome Cry and his dam is Switzler Roxcee. He was born on 4/14/06 and weighs 71lbs. Morning is a tiny white girl with only a few small red spots on her ears and over both eyes. She is the the tiniest foster her foster home has had weighing below 50lbs. 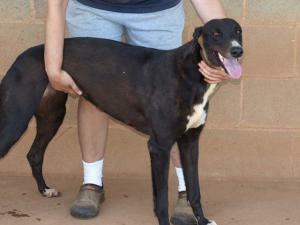 She is a sweet submissive but friendly girl that seems drawn to children but likes everyone. She is very polite and will back away from her food to let you have it if you approach while she is eating. She walks nicely on leash and rarely pulls. She will do her business on leash but needs a little time to find the right place so may do fine without a fenced yard. Morning is a playful fun loving girl and SO cute! Doc's Whipper, affectionately called Doc is a beautiful red brindle. He is a handsome boy who has a lot of energy. He almost immediately realized that toys were for his personal entertainment! He does well with children and seems to welcome their attention. His sudden movements might be a bit much for small children. He responds well to correction and is learning that the kitchen counters are off-limits. He has a people-oriented personality, and loves to be with his family members. His boundless energy and charm keeps everyone entertained and laughing. He is currently learning the do's and don't's of inside living and although very curious, he is adapting well. He walks well on a leash but requires a firm hand. What a great boy full of personality! Emmy is a world traveler. She was born in Ireland and was imported to race here. She raced 14 races at Derby Lane and Tampa but didn't win one of those. Because of her bloodlines Emmy went back to the farm to be a brood mom. She had 6 pups in 2006 and then was retired from being a mom. None of her puppies ever made it as far as the track and none have any races listed. Her sire is Spiral Nikita and her dam is Centenarys Devil. DOB 7/20/03. 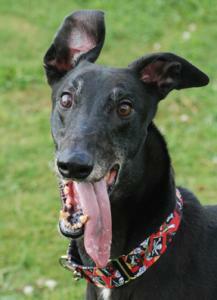 Emmy is a gorgeous shiny black female with a personality that shines like the brightest star. She is settling in with us & is an ideal foster - playful, friendly, affectionate & there is a little goofball hiding in there as well. More on Emmy soon! Tune Town raced at the Naples Ft Meyers track. Her sire is Jack Whistler and her dam is More Excuses. She was born on Christmas of 2006. She is a sweet girl who LOVES people. 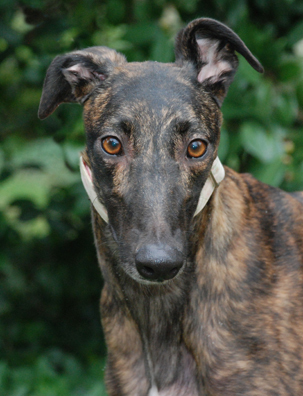 Tune is stunning with an unusually glossy, mahogany red and black brindle coat. She can be vocal when crated away from people so she would not be a good apartment dog. She potties on a leash so she might do OK without a fenced yard. She loved playing with the small dog in her first foster home so she should be good with dogs of all sizes. She loves people best, though, and would probably do best with a family with someone who is home a lot. She likes to go for rides and passed her cat test. Polo boy has no races listed. His sire is WW Apple Jax and his dam is Tycam Amstel. DOB 9/9/05. Polo boy has been a dream foster. Perfectly behaved in every way. Walks great on leash, picked up potty training quickly, great house manners from the start and very friendly and loving to everyone. His foster mom described him as a "Walmart Greeter" and says he greets everyone they meet on their walks like a long lost relative. His littermate is a therapy dog and Polo Boy would probably be an excellent candidate for that because of his easy going, tolerant personality. He is very good with the cat in his foster home and didn't even pay attention to a very small dog that tried to attack him on a walk. As perfect as Polo boy is he does have one problem. He arrived with a very small tumor on his foot. It was removed but is cancer and is likely to grow back in the next year. This isn't a type of cancer that is very painful or likely to move to other organs and kill him. It can be removed again when it comes back but each time it is removed it will harm more and more of his foot until he is likely to have to have his leg amputated. At this point he is not in any pain and has full use of his leg and foot so our vet has advised us not to amputate and let him keep the leg as long as he can. There is a chance that extensive radiation could slow the cancer down or stop it completely but that would be very expensive and the odds of it being successful aren't that good. Polo boy is looking for a special home that wants an almost perfect dog and won't mind if he ends up being a 3 legged dog at some point in the future. Amputations are pretty expensive and his family will need to be as sure as possible that they will be able to afford it when the time comes. Polo's adoption is being handled in a different way to help potential adopters with future medical treatment. If you are interested in helping this special boy, please contact GC Director Kim Owens. Izzy raced at the Lincoln Park Track. Her sire is Oshkosh Slammer and her dam is Drew Barry. 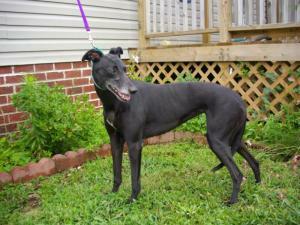 She is a sweet, playful girl and will make a wonderful first greyhound. She crates quietly and has learned how to walk up and down stairs and gets along great with her foster home's dogs and kitties. Izzy is a natural grinner and will smile and show her cute overbite when you say her name and give her attention. She really loves the kids in her foster home so will do well in just about any situation. She corrects quickly and wants to please and seems to be a fast learner so she may make a great therapy dog. Izzy is ready for a couch to call her own! Dee Dee is a sweet and loving girl! She is comfortable around men and wormen and soaks up any attention given by her humans. She is adapting very well to her new environment, enjoys her treats, and eats well. 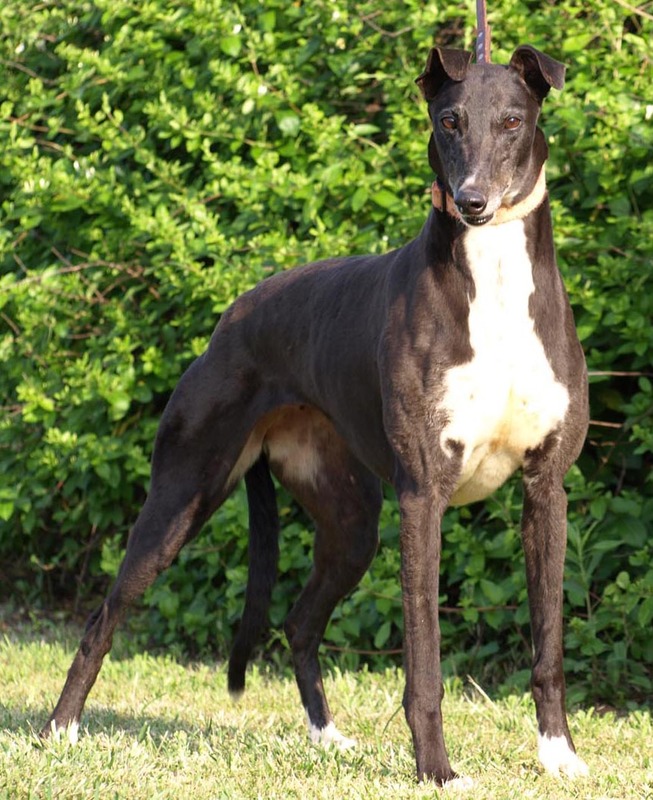 She is very independent and her love for people and independent personality would allow her to be placed in a situation where she is the only greyhound or pet in the home. Dee Dee is very curious and would spend hours in a small room investigating all of the treasures in the room but does not chew or destroy anything. Her foster families have told us she's absolutely no trouble at all....what a good girl! Her sire is WW Greys Drifter and her dam is Talking to Tish. She was born on 9/1/06. She raced 58 races at JCKC. She weighs 62lbs. 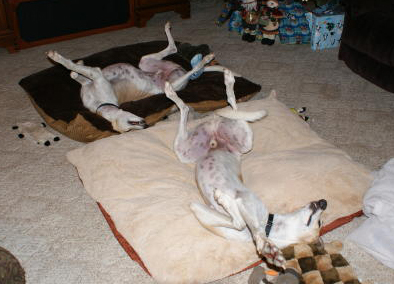 Hank celebrated his birthday on Dec 28th - the day he officially retired from racing. He was born in 2004. Hank is a super friendly guy that wants to be with people more than anything else. He walks wonderfully on leash because he just wnats to be right next to you. This tall guy has lots of personality and couldn't be any sweeter. He crates quickly but needs another quiet dog for company because he dislikes being left entirely alone. Hank likes to go for rides in the car. He passed his small dog test and while initially a little interested in the cat, responded well to correction and quickly lost interest. He should be trainable with cats with careful introductions and a few reminders on what is expected. Hank isn't comfortable in a home with the activity that comes with small children. This is a precious 'velcro doggy' who wants a quiet family to bond with. Owners who are home most of the time would be his dream! Windsleeve doesn't have any races listed and retired young. Her sire is the very famous Kiowa Sweet Trey and her dam is ICU Hot Tamale. She weighs 63lbs and her DOB is Nov 4th 2007. She passed her cat and small dog tests and has been living with both in her foster home. She is a very outgoing friendly girl that has a lot of personality. Skeela raced briefly at Southland, just 4 races. She is a daughter of the famous Dave The Dog that is retired in our area. Her dam is a dog we placed named My Little Ruthie. She was born on March 24th 2006. Skeela is one of a kind! She is a greyhound who thinks she is a tiny little lap dog. She absolutely loves to snuggle with her humans and insists on being cuddled up whenever you sit down. As part of the rules foster homes do not allow the fosters on any furniture but Skeela's greatest joy in life is to sit in your lap so whoever adopts her needs to be ready for a TV watching companion. She is also great with the cat, quiet in her crate, sleeps through the night on her dog bed beside her human, and has not had a single accident in the house. She walks great on a leash, loves to give kisses and will roll over and ask for belly rubs. She is truly a people centric hound seeming to prefer the company of her human to other dogs. Whoever adopts her is getting a one in a million dog! 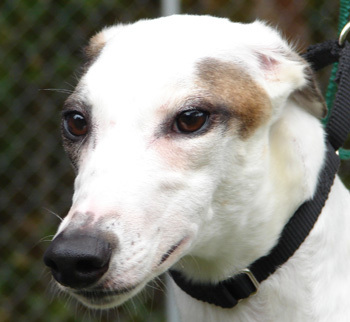 Marti is a sweet and affectionate little girl. She enjoys playing with her toys, napping, rolling in the grass and sunbathing. She loves to look at herself in the mirror and see how pretty she is! She is very good in her crate and is very quiet at bedtime. She has not had any accidents in the house and will come find you when she needs to go. She is extremely laid back and enjoys her quiet time. She is great with kids and other dogs. She is an all-around great Greyhound! Her sire is Baci and her dam is Valid Ten Pot. DOB 8/27/06. 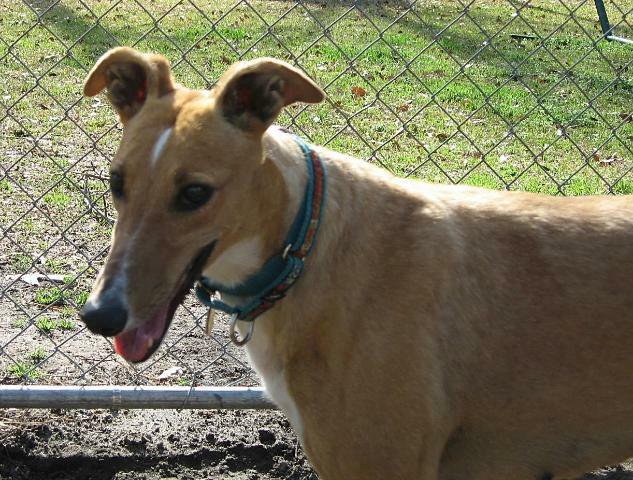 Kara is a cute happy little girl that raced at Dairyland and then JCKC in FL briefly. She wasn't a good racer because she had contracted a tick disease and was weak and too thin as a result. We found the tick disease after she was retired and came to us. Her sire is Gable Dodge and her dam is Pride of Iowa. Kara was successfully treated for her tick disease and once she was feeling better showed that she has an exceptionally high prey drive to all other animals large and small. When she was sick she didn't care about chasing anything. Kara is well behaved and tries to please though. Kara has quickly learned house manners and has done well with potty training. She is very devoted to her family. She is pretty outgoing with most people and even more so once she knows you. Kara is so happy and waggy that she injured her tail wagging it and had to have it cropped three times before we finally docked it short enough that she couldn't hit anything with it and re-injure it. Now she has a happily wagging tail stub. It really suits her, though, and couldn't be any cuter. Even though Kara has an exceptional prey drive she has been able to be trained to live with a small dog and cats in her foster home with a lot of work and supervision. 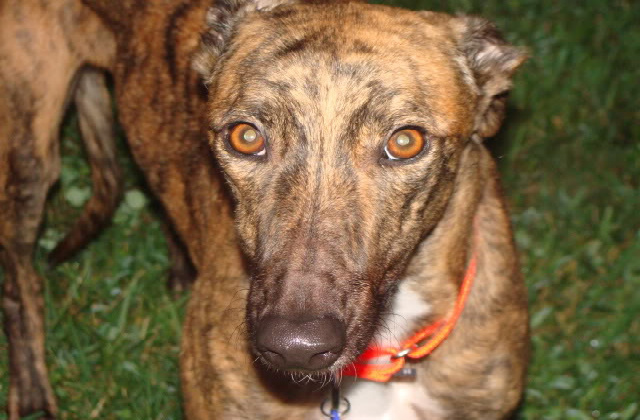 She would do better in a home with either no other animals or just other greyhounds. She needs careful introductions to any animal other than a greyhound and is gradually learning that she is not supposed to chase everything. Each new animal is a new experience for her though. She walks great on leash and potties great on leash. She has been very quiet in her crate in her foster home but when she was in a kennel situation she was pretty loud and would excitedly bark whenever a person came close to get their attention. We are unsure whether she would be OK in an apartment. Update on Kara. She was eventually able to be placed with a small lab and they were best friends until she passed away. Kara died much too young at 6 years old of a fast growing cancerous tumor on her skin. Helen is being treated for a 'tarsocrural luxation'-- torn ligaments and tendons below her hock. She has an excellent plan for treatment and is expected to make a very good recovery. Helen is a sweet, laid back, tolerant girl which has made her a favorite at the vets. She accepts even painful treatments with no problem and is always happy to see the vet and vet techs. She is tolerant with small dogs and cats. She was able to move into a foster home for a short time and had very good manners there from the start. She had to be moved back to the vets because of some problems getting her leg to heal and is still at the vets now. Helen is quiet in her crate and potties well on leash so she may be a good apartment dog. We are optimistic that we will be able to save her leg and are hoping she makes a full recovery but she may end up with a limp or not having full use of the leg. Either way she will be an awesome pet for a lucky family. Update on Helen, she has become a Therapy Dog and is a wonderful girl. Brenda was a good racer racing at the top AA level at the Lincoln Park track. She also raced at Raynham Taunton and has 109 races listed. Both tracks are closed now. Brenda went back to the farm to be a brood mom. She had one litter of 11 puppies in Feb of 2009. The pups were just weaned and Brenda is officially retired from mom duties. Her sire is the famous Brett Lee and her dam is San Tan Gem. More as we get to know Brenda. Annie is a social butterfly. She loves everyone big or small, male or female. She will crawl up in your lap to snuggle if given the chance. You won't find a more loving or sweeter little girl. 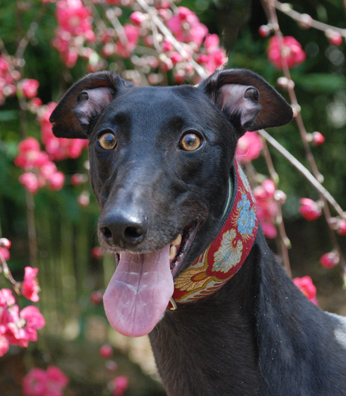 She is a real beauty with a glossy black coat and beautiful golden eyes. 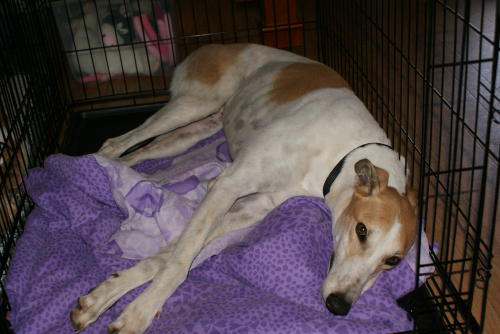 Annie crates quietly and is very well behaved and has lived in a townhouse without disturbing the neighbors. She has home experience and already has excellent house manners. Annie likes to go for walks and will potty on leash so may be OK without a fenced yard. 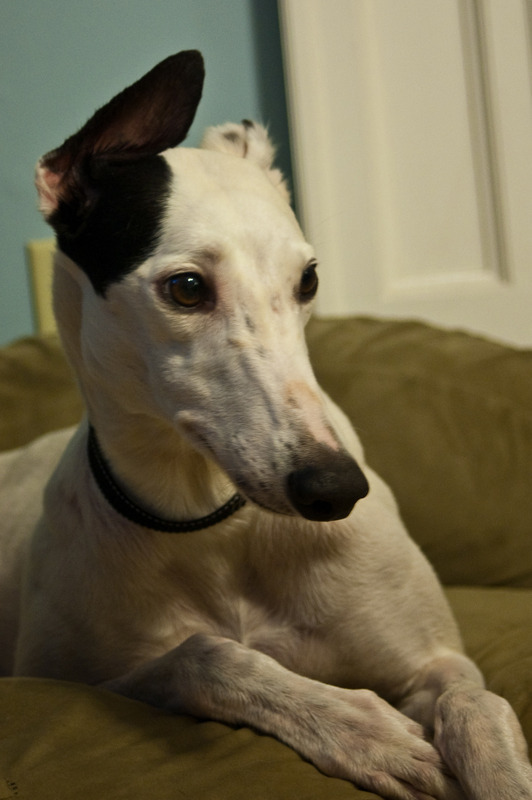 She gets along well with other greyhounds and large dogs. Annie has learned to be OK with small dogs as long as she is properly introduced. She used to sometimes mistake them for bunnies so she often needs to sniff new small dogs before she understands that they are dogs. She probably has too high a prey drive to live with cats. Her sire is Redmoon Clyde and her dam is Rufflemyfeathers. DOB 11/6/05. Lisa raced 10 races in Birmingham. Her sire is Loxahatchee Dash and her dam is Miz Gracie Allen. She raced at 67lbs so she is large for a female. DOB is 5/26/02. Lisa was returned to us from her previous home. She was vetted with a fresh teeth cleaning and is ready to seek a new couch of her own. She passed her cat and small dog tests and seems like she is good with kids. More as we get to know her. May raced 27 races at Lincoln Park and Palm Beach. She wasn't very good but had a blood line that was good so she became a mom after she retired. She had 3 pups in January of 2009 and now has been retired from that life too. May was born on 3/24/05. She has settled into her new foster home very nicely. She walks very well on leash & potties on leash, crates well & loves to go on car rides. 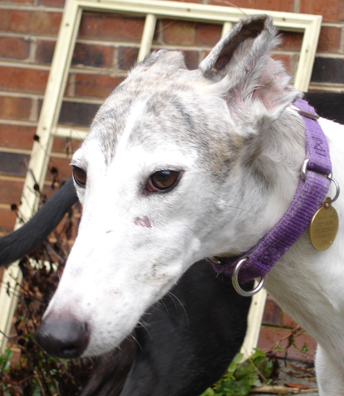 May can be an active girl & just loves playing with her toys, squeakies best of all!! She's gotten along very well with long dogs & 5 lb dogs in her foster homes. She can get a little protective of toys she's playing closely with tho so is learning manners on proper sharing. She's a small to average size girl at around 62 lbs & has a gorgeous petite face. We got to introduce her to stairs which she took in stride with a little practice. May would love to have 2 legged or 4 legged siblings to play with & a fenced yard or play dates to stretch her legs every so often. She is a social butterfly & enjoys going to meet & greets to show off her beauty & meet everyone that will stop to pet her. May also enjoys the quiet moments of snuggling on the floor & would fit into almost any home!! Mia has no races listed. Her sire is Cool Performance and her dam is Oakland Paige. She is a small brindle girl that weighs only 54lbs. Her DOB is 6/20/07. She passed her cat and small dog tests so should be able to live with either. Babbagnoosh is a sweet, small, laid back boy that loves to play with toys. He is very shy and takes a long time to warm up to people, especially men, so would do best with at least one female in the family. His foster family says he is very loving once he warms up and is one of the sweetest fosters they have had. Babba is likely to be fearful at first in any new home for the first month or two and will respond to quick movements by fleeing to his crate. He needs an understanding family that is OK with this and will not give up on him. As shy as he is, he has never tried to snap and hasn't even growled in fear. He is a sweet gentle guy that will warm up if he is given enough time. Babba is definitely not a dog that will happily greet you at the door at first but he can become that after a few months. He gets along great with other dogs, both large & small and seems to be less nervous with other confident dogs around as a good example. His dream home would have a confident friendly dog in it for him to be pals with. He crates perfectly and will "talk" when he needs to go out. His foster mom says it is the funniest sound she has ever heard - it's as if he is trying to form actual words. Babba will do best with a fenced in yard as new things spook him while out on a leash. If you are willing to give this sweet guy plenty of time to warm up to you then he will be forever devoted and very loving. 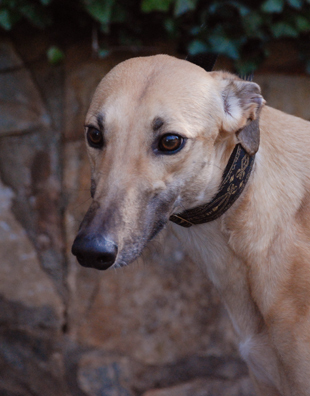 Babba would do best in a quiet, low-key home without active small children. Although he poses no threat to them, their quick movements and noise seem to make him uncomfortable and he will retreat to the safety of his crate. Babba tested cat tolerant. Because of his shy nature Babba has been waiting on a home for a long time so has had plenty of house experience and has done well with his potty training and house manners in his foster home. Please consider giving this very special little guy your heart. 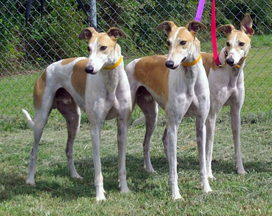 Dodge raced at Jefferson County Kennel Club until Sept 2008. He tried hard but never got out of the maiden races and never won a race after 31 tries. His sire was WW Greys Drifter and his Dam was Talking to Tish. His racing weight was 73lbs and his DOB was Sept 1 2006. Dodge was adopted in 2008 by the Ketchie family. He lost his battle to Lymphoma on 2/26/13 at just 6.5 years old. Rockstar raced at Raynham/Taunton and Wonderland tracks in Mass. He raced 25 races and only won 1 race. We got him from Orlando where he was moved but he didn't have any races we could find there. Rockstar raced at 73lbs and will turn 2 on July 9th. His sire is Craigie Whistler and his dam is Kelsos Jetski. He settled into foster care very well. He is a smart boy that loves walks and is excellent on leash. He is good with other dogs of all sizes and loves to play. He is quiet in his crate and learning to do stairs. His one flaw is counter surfing which we are working on.